Videos, audio and loads more bonus content! Rhythm is available now on iPad, and even better it is packed extra video, audio and more. That means by ordering Rhythm from the App Store you can enjoy the ultimate learning experience with world-class video and audio tuition available at the tap of a button. Within interviews and features readers will find bonus videos offering everything from kit tours with the biggest drum stars, interviews and playing tips, to kit restoration walk-throughs and expert recording guides, and with our exclusive image galleries you can take a closer look at the very latest drum gear. Couple this with our stunning artist photography and there has never been a better time, or way, to read Rhythm. 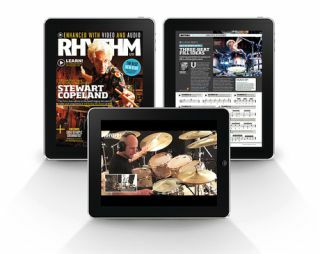 To read the latest enhanced edition visit www.rhythmmagazine.co.uk/digitaledition or search for 'Rhythm Magazine' on the App Store.